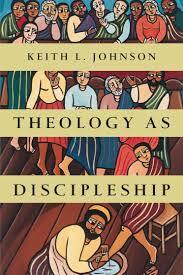 Johnson, Keith L. Theology as Discipleship. Downers Grove: IVP Academic, 2015. Keith L. Johnson is Associate Professor of theology at Wheaton College. He is also an ordained Baptist minister and has been on faculty at Wheaton since 2008. Johnson holds a doctorate from Princeton Theological Seminary (2008) and a Th.M. from Duke Divinity School (2004). His work is in systematic theology with special emphases in modern and contemporary theology, the relationship between nature and grace, the doctrines of the Trinity and Christology, and the relationship between Protestant and Roman Catholic theology. His other works include Bonhoeffer, Christ and Culture (co-edited with Timothy Larsen, 2013), Karl Barth and the Analogia Entis (2010), and The T&T Clark Companion to the Doctrine of Sin (co-edited with David Lauber, forthcoming). Theology as Discipleship attempts to bridge a widening chasm between practical Christian living and the discipline of theology, particularly in the church itself. This gulf is the raison d’etre for the book. According to Johnson, even seasoned Christians have difficulty figuring out “how they relate.” As a result, many theologians pursue their discipline without a clear understanding for the very reason they do so. Conversely, many average churchgoers look upon the very word “theology” with a layman’s suspicion. Theology as Discipleship is, in many ways, a call to return to the basics of theology. Johnson’s purpose in the book is to explain “what theology is, how theology is possible and what it looks like for a theologian to practice the discipline as an act of faith and obedience.” (12) The ultimate goal of the book is to highlight the “why” of theology as it relates to discipleship. To address the rising authority of the secular sciences and the tension therein, Friedrich Schleiermacher sought a way forward that slowly transformed church leaders into academics. As a result, as Johnson observes, “Now the direction of movement reversed. Theologians interacted with these same disciplines not in order to reframe them in light of their faith but to secure theology’s place in the academy alongside every other discipline.” (31) Johnson praises Schleiermacher’s approach for its recognition of the need for critical reason, but he also critiques this same approach for its lionizing of critical reason above the authority of Scripture. Hence the author suggests we work in the opposite direction: beginning on the basis of Jesus Christ. Unlike Schleiermacher who began with the standards of rationality, Johnson believes that the starting point for our faith and our theology should be found in Jesus. Furthermore, the discipline of theology is a “participation” or “partnership” with Christ Himself. As the “subject” who establishes this relationship, God achieves this participation by uniting us to Himself in Christ through the Spirit. God’s acts are always purposeful and never arbitrary (Eph. 1:3-14). They are a part of His eternal knowledge of all things, including His own being and all of His actions – past, present, and future. In Christ, Johnson states, we have been given a new story, a new history. According to Johnson, “God’s revelation in Jesus Christ reconfigures our understanding of everything. When we see the world through the lens of Christ, we see the truth about reality.” (51) Jesus and Jesus alone determines history’s meaning and outcome. As he does frequently throughout the book, Johnson cites Karl Barth to emphasize this Christocentric interpretation of history: “The history of salvation is the history.” In Christ, the sinner not only perceives reality correctly; he is also able to participate in the inner life of the Trinity as the Triune God intended it. Johnson calls this predestined narrative the “Trinitarian plot” or “Trinitarian pattern,” as outlined in Galatians 4:4-7. Christians are participants in the divine life of God Himself. Trinitarian life begins in union with Christ by the power of the Spirit, who makes us participants in Christ. This is very much a central motif of the book. Johnson elucidates and explicates this concept in subsequent chapters. He is also careful to distinguish between participation in Christ and being Christ. For instance, like riding a train, the Christian has intimate knowledge both of God and His movements, without of course becoming God. The starting point for this unique, God-purposed union is found in the incarnate Son of God. Therefore, when we confess Christ, we are confessing both His Person as well as “the history of his eternal life” as the basis by which everything is understood. In chapter four, Johnson establishes his thesis that Scripture, both Old and New Testaments, must be read Christocentrically. Our participation in Christ extends to the very way we apply His Person and work to the Word of God, recognizing the “fullness of time” by which Christ fulfills all of salvation history. Johnson contends that Christ’s life is the “criterion” by which we should measure all claims regarding God’s authority. As the Bible is a “single whole,” Christians have license to fix Christ at its center. The Spirit frees us to do so. Johnson affirms, “To say that the words of Scripture are God-breathed is to say they must be interpreted in light of Christ because the God who speaks these words is one and the same as the God who became incarnate in Jesus.” (96) Whereas in John 8 the Pharisees started with Abraham as the starting point for Scriptural interpretation, Christ began with Himself, effectively declaring Himself as the keystone to God’s plan for salvation. Johnson seeks to present two distinct principles in this chapter: (a) the Scriptures naturally lead us to the knowledge of Christ and (2) Christ is the key to understanding those very same Scriptures. In this way, Johnson affirms a Christocentric hermeneutical circle of sorts. If we learn to interpret the Scriptures rightly, we may eventually do the same for history itself and our own lives as we participate in Christ. The Bible, however, is not simply a repository of facts concerning Jesus Christ. It is incumbent upon the reader to investigate and excavate the precious truths contained in the narrative of Scripture. Interestingly, Johnson uses Augustine to describe the “double love” for God and neighbor. Reading Scripture should exercise this love. For Johnson, “Scripture functions much like Christ’s human nature did: it reveals the wisdom of God through accessible human words and prompts us to love God in the pattern of Christ.” (112) Matthew 22 then serves as a kind of lens for interpreting Scripture for Johnson. By the illuminating of the Spirit, we interpret the Bible in light of God’s love and to promote our love of Him in return. Another way that we maintain a proper reading of Scripture, according to Johnson, is by listening to the “church’s voice” as a source of hermeneutical accountability. Johnson allots significant authority to church tradition when he asserts, “Our deference to the teaching of the church is thus deference to God’s act of entrusting his message to it.” (119) Therefore a proper interpretation of Scripture must not depart from the historical teaching of the church. By beginning with Jesus, we are adhereing to the very same hermeneutic employed by the Apostle Paul and his “Christological interpretation of reality, history and Scripture.” This interpretation, according to Johnson, is “an ongoing process” with goal of following Christ as the Spirit leads. Christ is the “lens” and the telos of Scripture. Whereas the Judaizers of Paul’s day adhered to an egocentric hermeneutic, Christians must adopt a Christocentric approach while seeking to add their own voices in deciding how best to partner with God in His saving work. From the introduction to the book to its last pages, Johnson’s task to “rebuild our understanding” of theology is a thoroughly Christocentric endeavor. Johnson reminds his readers early on that “the starting point of our faith” is Jesus. (37) Consequently, the primary motif of “participation” of Christ informs every other theme in the book. Theology as Discipleship begins by dissecting the current problem in the church and slowly makes it way to the matter of obedience, which proves to be his real goal for the book. The author achieves his goal by gradually fleshing out the idea of “partnering with Christ.” According to Johnson, “Because our knowledge of God comes through our participation in the mind of Christ, it makes sense that the practice of theology will be linked directly to acts of obedience that stand in line with Christ’s actions.” (162) In addition to the ubiquitous “mind of Christ” theme, Johnson even defines words like “theologian,” “covenant,” and “koinonia” in terms of partnership. (62, 66, 76) He even explains the concept of love in “the language of partnership.” (80) The book’s thesis stands or falls with the proper extrapolation of this overarching concept, therefore Johnson commits ample time to it. At the beginning of his book, Johnson remarks, “Scripture enables us to see the true nature of created reality and history, and one of our key tasks is to figure out how to participate in reality rightly by finding our place in the history narrated by the text. For these reasons, much of the argument presented here takes place through close theological readings of Scripture.” (13) The goal, says Johnson, is to further accentuate the primacy of Christ and the Spirit in history. Throughout Theology as Discipleship, Johnson faithfully follows his own methodology, consistently weaving together systematic theology and biblical exegesis. For example, in chapter two, the account of the Lystrans’ “misguided functional theology” in Acts 14 serves as a paradigmatic warning for the rest of the chapter as Johnson details the task of the discipline of theology. Exegesis of Mark 8:33 as well as of Ephesians 1:3-14 in the very same chapter attest to Johnson’s commitment to Scripture as a crucial buttress to theology. However, Scripture is more than simply a tool for the discipline of theology. For Johnson, Scripture displays God’s “communicative nature” and must be viewed as God’s own speech. Chapters four and five are dedicated exclusively to the theme of Scripture precisely because, for Johnson, the Word of God is the way we “participate” in the mind of Christ. We participate in God’s knowledge of Himself. Johnson’s Christocentrism supports another of the book’s strengths: a Trinitarian perspective of the Christian life. Theology as Discipleship is a masterful presentation of the believer’s “participation” of the life of the Trinity. For many in the church today, including theologians, the doctrine of the Trinity is often relegated to academia. However, Johnson’s theological and didactic skills are most evident in his ability to bring such a weighty doctrine into relevance for the average Christian. “God the Father sent his Son into history to join himself to us so we could live in union with him by the power of the Spirit.” (58) Johnson calls salvation history the “Trinitarian plot,” and he sees God’s actions throughout history according to a “Trinitarian pattern.” Rather than simply looking upon the doctrine of the Trinity with a distant awe, Johnson encourages his readers with the promise that Christians share Christ’s “relationship with the Father through the power of the Spirit.” (57) We are participants in God’s own divine life. In this way, Johnson both exalts the transcendence of God as well as His intimate relationship with sinners. According to Johnson, “he comes to us not as an object but as a living and active subject who meets us in the midst of his divine plan to save us through the Son and the Spirit.” (162) In Theology as Discipleship, the triune God isn’t simply a mystery; He’s also deeply personal. The ubiquitous “participation” theme allows him to balance both in the book. While this concept of koinonia is wonderfully traced throughout the work, at times Johnson’s compatibilism seems to diminish the objective work of Christ, distinct from that of the believer. For example, Johnson contends that Christ’s intercession for us before the Father is, in part, accomplished by “partnering with us as we follow him in discipleship.” (128) The author quotes Romans 8:34 to support his claim, however, Paul’s famous discourse on Christ’s inseparable love is founded on His justification (v.33), not our participation. While the point could certainly be made that union with Christ affords us this justification (e.g. Calvin’s “double grace”), such is not Johnson’s point when discussing discipleship. Perhaps the author’s point could still be made without reaching into Christ’s intercession. Regardless, Johnson avoids a synergistic soteriology even as he details the believer’s “participation,” and this is to be commended. The only obvious lacuna in Theology as Discipleship is, ironically, the definition of discipleship. Throughout the book, Johnson makes assertions such as “Theological learning is pursued rightly when it occurs within the context of a life of discipleship, because the practices of discipleship enable and enrich our pursuit of theological knowledge.” (26) However, Johnson never actually explains the meaning of the word. The reader is simply left to assume that it connotes something similar to “the everyday practices of Christian life.” (11) Still, for such an axiomatic theme and word, the absence of a definition is somewhat troubling. Johnson makes time to define other words like “theologian” and “covenant,” and this would have been desirable for “discipleship” as well. It is clear that one of the goals for the book was to define discipleship in terms of “participation,” however, nowhere is this explicit in a definitive sense. Despite this absence, Johnson’s Theology as Discipleship is an excellent resource for theologians and pastors alike as they bridge the academic-ecclesiological gap. Indeed, the discipline of theology needs this book. Friedrich Schleiermacher, Brief Outline of Theology as a Field of Study, 3rd ed., ed. and trans. Terrence N. Tice (Louisville, KY: Westminster John Knox, 2011), 3. Karl Barth, Church Dogmatics III/1 (Edinburgh: T&T Clark, 1958), 60. Augustine, On Christian Doctrine 1.4.4.